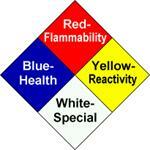 ChemAlert rates hazards numerically inside the NFPA (National Fire Protection Association) diamond. This symbol was chosen for its universality. The diamond has a red segment (flammability), a blue segment (health, i.e. toxicity), a yellow segment (reactivity), and a white/blank segment (special warnings such as radioactivity or no water). Printed over each is a bold black number expressing the degree of the hazard. WHITE Corrosive. May harm skin, eyes, or mucous membrane. GREEN or Presents no more than moderate hazard in any category. HEALTH - The degree of health hazard of a chemical or material is based on the form or condition of the material, as well as its inherent properties. The degree of health hazard of a material should indicate the degree of personal protective equipment required for working safety with the material. 1 is for slightly hazardous (toxic) material which requires only minimal protection (for example, safety glasses and gloves) in addition to normal work clothing to work with safely. 2 is for moderately toxic or a hazardous or moderately toxic material which requires additional PPE or equipment (e.g. chemical goggles, lab/work smock, local ventilation) in addition to that required for less toxic material. Consult the MSDS for specific health hazard and proper PPE to use with this material. 3 or 4 is for highly to extremely toxic (deadly) materials (and any carcinogen, mutagen, or teratogen). These materials will require specialized equipment (e.g. respirator or exhaust hood, full face shield, rubber apron, specialized glove, handling tongs, etc) beyond that required for moderately toxic material. You must consult the MSDS and/or other safety information to determine the hazard (acute or chronic) and the proper PPE and engineering controls to safely use this material. FLAMMABILITY or FIRE HAZARD - The flammability or fire hazards deal with the degree of susceptibility of the material to ignite and burn. The form or condition of the materials, as well as their properties, affects the extent of the hazard. Many hazardous materials such as acetone and gasoline, have a flash point (ignition temperature) far below freezing and will readily ignite with a spark if the vapor concentration is sufficient. 1 is for materials with a flash point above 200ºF. 2 is for materials with a flash point below 200ºF but above 100ºF. 3 is for materials with a flash point below 100ºF but above 73ºF. 4 is for materials with a flash point below 73ºF. 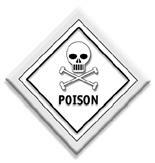 REACTIVITY - The reactivity hazards deal with the potential of a material or chemical to release energy. Some materials are capable of rapid energy release without any catalyst, while others can undergo violent eruptive or explosive reactions if they come in contact with water or other materials. Generally this rating is used to indicate the potential to react if the material is heated, jarred, or shocked. 1 indicates a material that may be reactive if heated and one that reacts with water. 2 indicates a material that may react violently without detonation. 3 indicates a material that may detonate or explode if subjected to a strong initiating force or heating under confinement. 4 indicates a material that readily detonates or explodes. 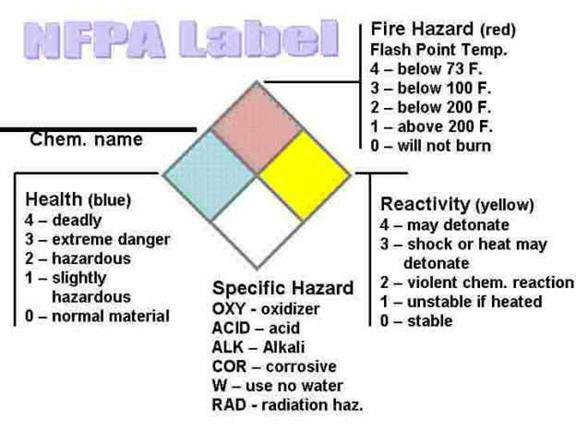 SPECIFIC HAZARD - An open space at the bottom of the NFPA diagram can be used to indicate additional information about the chemical or material. This information may include the chemical or material's radioactivity, proper fire extinguishing agent, skin hazard, its use in pressurized containers, protective equipment required, or unusual reactivity with water. OX or OXY indicates a material that is an oxidizer. W or W indicates a material that is water reactive. ALK indicates a material that is alkali. COR indicates a material that is corrosive. RAD indicates a material that is radioactive. All containers that hold carcinogens, reproductive hazards or acutely toxic chemicals must be properly labeled concerning the health hazard posed by the chemical. Most containers will have the chemicals hazard clearly displayed on the label. However older chemicals and containers of solutions that are mixed in the lab must be properly labeled by the laboratory worker. The laboratory worker may write the hazard class (e.g. carcinogen, etc.) on the container or use labels available from their Supervisor or Chemical Hygiene Officer.